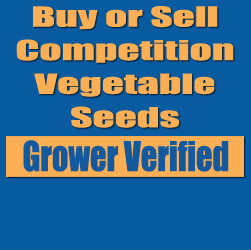 All seed purchases made on WorldclassGardening.com are shipped directly from the grower of the seeds. Neither germination nor performance of the seed is guranteed. The only guarantee is that the grower of the seed will ship the seed to you - verifying the seeds authenticity. In the case of delayed or lost shipments, or disputes of any kind, the purchaser should contact the grower of the seed via our internal messaging center, and commence to resolve the issue. No refunds will be granted by WorldClassGardening.com except as directed by the grower of the seed. The grower of the seed must contact dlangevin@worldclassgardening.com with any refund granted. WorldclassGardening.com will then refund the purchaser by crediting his or her credit card. Shipping and handling will not be refunded.